Dell servers have been optimized to help provide strong support for the latest ESX release, VMware ESX 3.5 Update 2, including enhanced performance for virtualized environments based on support for six-core Intel Xeon processors. Organizations that do not approach server virtualization with a clear plan risk developing a chaotic, inflexible infrastructure that wastes energy and resources. However, with appropriate planning, enterprises can leverage virtualization to enhance agility and service, simplify IT management, and empower staff to focus on strategic priorities while conserving energy and resources. 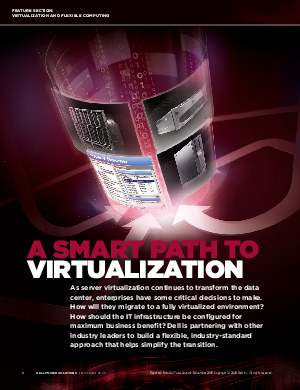 Download this brief now to learn how Dell charts a smart path to virtualization through use of its comprehensive range of management tools and services for virtualized systems.